This booklet is designed to help defendants and their families prepare for the possibility of custody. It gives information and advice on the various stages of this process - arrest, bail, custodial remand, planning ahead, court, sentence, reception into prison. There are also useful contacts given at the end of the booklet. To access the booklet click on the link below. This leaflet by Ormiston Families is aimed at parents in prison, detailing the importance of staying in contact with children and the ways that this can be done. It highlights some of the key issues with regard to the child's care and emphasises the importance of the imprisoned parents role, in making life easier for their child. 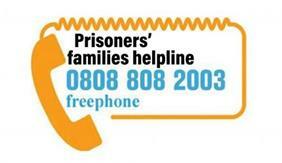 Also listed on the leaflet are a number of key contacts for parents in prison, their children and families. Download below. 18. What shall I tell the children? This short leaflet details ways of dealing with telling a child that a parent is being sent to prison and can be used by both families and professionals. It covers questions such as what and when you might tell the child, how to deal with the future and whether other people need to know. The leaflet also contains a list of useful contacts for families which might help support a child in this situation. Download 'What shall I tell the children?' below.